Victor Milan's The Dinosaur Princess is a thrilling epic fantasy adventure set in an alternative world of intrigue, beauty, brutality…and dinosaurs. 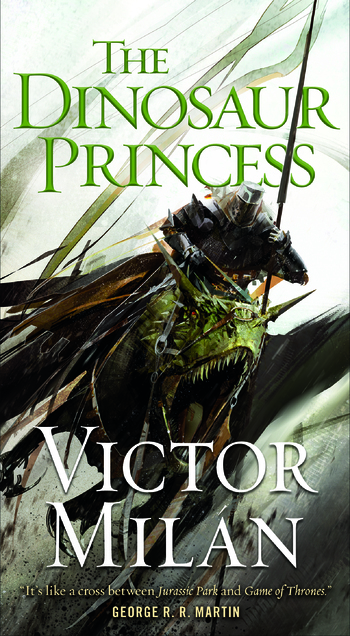 The Dinosaur Princess is the newest epic fantasy adventure set in a world where knights ride armored dinosaurs into battle, hailed by George R. R. Martin as "A cross between Jurassic Park and Game of Thrones." In previous worlds VICTOR MILÀN has been a cowboy and Albuquerque's most popular all-night prog-rock DJ. He's also the author of the award-winning Cybernetic Samurai, and The Dinosaur Lords. He's never outgrown his childhood love of dinosaurs . . . and hopes you didn't either.